What makes the Despicable Me films so engaging and attractive is the fact that they have a lot of heart. They feature an evil villain who changes his life because he has found love–not in a soulmate, but in 3 girls that he adopts. 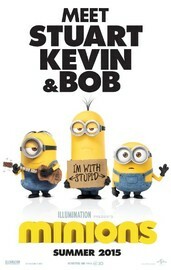 This prequel movie tells the origin of the minions and how their journey up until they meet Gru. They can’t seem to keep a villainous master, but then then they meet Scarlet Overkill (Sandra Bullock), who is the baddest of them all. She hires the minions as her henchmen and orders them to steal Queen Elizabeth II’s crown. The minions are adorable and hilarious, but there’s more to a movie than that. We need that extra dynamic that Gru (Steve Carell) provides us with in Despicable Me. He plays the straight-man to the minions’ ridiculousness. Bullock didn’t work well as the voice of Scarlett Overkill. There was no playing off of each other between her and the minions. She was actually quite annoying. The first act was really entertaining and funny, but once they start working for Overkill, the film drops the ball a little bit. Among that, the script has a few obvious plot holes and head scratchers, and the plot is really scatterbrained in general. And without the smooth score of Pharrell Williams, Minions just doesn’t have that charismatic oomph of the Despicable Me films. Minions is funny, but does so without the emotional attachment of its source material. I felt very disconnected to the characters. Obviously, we’re rooting for the minions, but there isn’t really anything at stake. It simply just acts as an origin story and nothing else. I do applaud the direction for the impressive coherence despite not being able to understand the minions due to the fact that they don’t speak English. But overall, we see that as adorable as the minions are, we need the whole package.